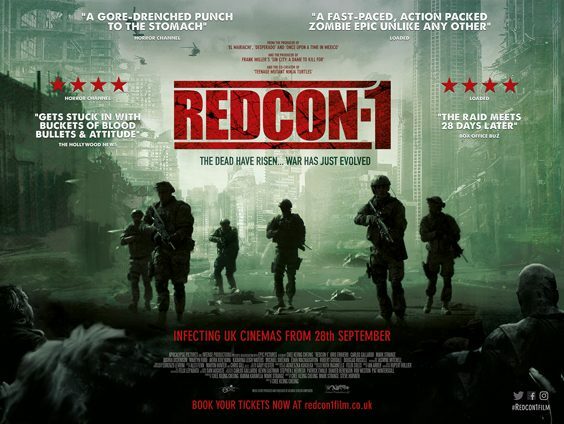 I’m impressed with your new film Redcon-1. It’s got the scope and scale of 28 Days Later and World War Z.
Yeah, Chee’s done an amazing job to get this project not only off the ground, but to get it completed as well. It’s been a lot of hard work. Was there a desire to do a zombie movie, or was there something about the director/writer that drew you to it? To be honest a bit of both. I love the couple of films you’ve just mentioned there. I absolutely loved World War Z. I think I’d just seen that when I started talking to Chee about this project. Mark Strange, who’s also in the film and is also one of the producers, he’s actually one of the fight choreographers at Corrie. We started talking about this years ago. The first time I was on set with Chee was just after I left Corrie; we were up at Lancaster Prison, and there was a huge riot scene. 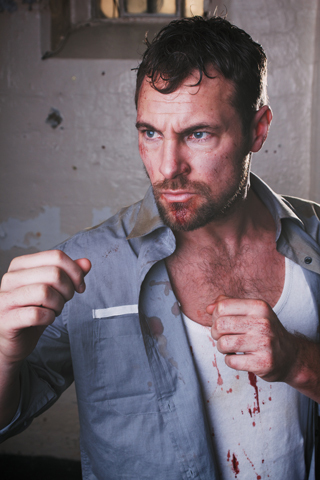 We had over 200-odd supporting artists, and it was the biggest fight scene that I’d ever done in my life. That was incredible, and it was the teaser so that Chee could help raise some funds and get the project green-lit for the full feature, and bring on the right crew and the right actors, etc. And as soon as I stepped on the set that day, I knew the kind of scale of ambition that Chee had with this project, and it was a no-brainer for me to be involved really. It’s a few years since your Weatherfield days. Did you have any encounters with grumpy Corrie fans after what your character Rob did to Tina? I got away with it pretty lightly to be honest with you (laughs). I was pretty fortunate there. I played it in such a way that some people actually felt sorry for Rob. I don’t know how I did that. They were good times. Is the door still open for Rob to return to Corrie? Yes, he’s still behind bars. I’ve already been back twice to do some little stints. I guess with that we’ll just see what happens. I’m definitely not averse to it. I’ve been lucky with all the storylines I’ve always had in there. It’s an amazing place to work, but we’ll see. I’ll cross that bridge if and when it turns up. I’ve just finished a TV series called London Kills, that Hugo Speer and Sharon Small are leading. I think it’s out next year. There’s not a release date as yet. Last week I had a night shoot on a project called Off Grid, that I’m working on with James Cosmo and Alison Steadman. So that’s been great. I’ve got to work with some really nice people. When people ask me “What’s it like being an actor?”, the only answer that I can truly give is it’s exactly like any other job where you’re self employed. And it’s a tough industry. Every time that I am on set and I am working, I feel very, very fortunate to be in that position.